The jack of diamonds and the queen of spades are the "pinochle" meld of pinochle. Pinochle (English pronunciation: ) or Binocle (sometimes pinocle, or penuchle) is a trick-taking card game typically for two to four players and played with a 48-card deck. It is derived from the card game bezique; players score points by trick-taking and also by forming combinations of cards into melds. It is thus considered part of a "trick-and-meld" category which also includes a cousin, belote. Each hand is played in three phases: bidding, melds, and tricks. The standard game today is called "partnership auction pinochle." Pinochle derives from the game bezique. The French word "binocle" also meant "eyeglasses". The word is also possibly derived from the French word, "binage", for the combination of cards called "binocle". This latter pronunciation of the game would be adopted by German speakers. German immigrants brought the game to America, where it was later mispronounced and misspelled "Pinochle." Auction pinochle for three players has some similarities with the German game skat, although the bidding is more similar to that of bid whist. 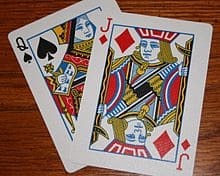 A pinochle deck consists of two copies of each of the 9, 10, jack, queen, king, and ace cards of all four suits, for 48 cards per deck. Aces are always considered high. Pinochle follows a nonstandard card ordering. The complete ordering from highest to lowest is A, 10, K, Q, J, 9. The game can also be played using standard ranking with a simple change to scoring. Originally, the deck had to be composed by combining two poker, piquet or euchre decks and removing unneeded cards (a piquet deck does not have the 2-6, making it easier to modify, and a euchre deck is exactly half a pinochle deck), but with the game's popularity in the United States in the early 1900s, a single boxed deck with the necessary cards was marketed, and these specialized pinochle decks are now widely available in similar styles to common 52-card counterparts. Variants of pinochle can be played with five, six, eight or more players. These larger variations can combine two pinochle decks called a "double deck". The double deck can also be used when playing with 4 players; hand sizes, average scores and minimum bids are doubled. The game is played with a pinochle deck of 48 cards and 4 players; one player is the dealer. After the shuffle, the dealer will offer a cut to the player on their right, then distribute the cards. All the cards are dealt in partnership pinochle. In variations for odd numbers of players like three, a widow's hand' (also called a "kitty", "talon", or "stock") of cards remain. Traditionally, the deal is done clockwise, dealing a packet of three or four cards at a time, starting with the player to the left (the eldest hand) and ending with the dealer. The deal rotates clockwise, so the dealer's left-hand opponent will deal next. Some players use a house rule that if a player receives a hand with an abundance of nines (variously, "a hand of 6 nines, or 5 nines and no meld", or "4 nines and no Aces, or 5 nines and only one Ace", for example), they can toss in their hand and declare a misdeal; the cards are then re-dealt by the same dealer. An accompanying rule sometimes limits the number of re-deals to three. Each bid must be greater than the previous one, and be a multiple of 10 or 25 (if playing without trailing zeroes, the bid must be one or two greater respectively). When a player passes, they can no longer bid. The auction ends when all subsequent players in rotation have passed after the last bid. The last bid becomes the contract. The player that made this final bid will then declare trump in the suit that is desired. In some house rules, trump cannot be declared in any suit not containing a run, marriage or dix meld. In order for the winning bidder to win the hand, the combined total of melding and trick points must be equal to or greater than the winning bid. Thus bidding involves anticipating the points that will be accumulated from melds and from the points accumulated from winning tricks. If the combined score is lower than the bid, then the bidding team or player has been set. This means that the total bid amount is subtracted from the total game score, often accompanied by losing the points scored in meld for that hand as well. This can result in a negative score. A related though different style of bidding is for the players to bid individually, and partners' bids are then summed. The winning bid only decides trump; both (or all) teams' bids become their contract, meaning any team can score or be set. This creates a more balanced game. A house rule often used with this style of bidding is that a player or partnership must have a minimum number of meld points (usually 20 or 200 depending on point scales) in order to bid, and if it is discovered that they do not, a mis-bid is declared and the team's contract is null, with or without a penalty. In some versions of Pinochle, after the bid has been taken and trump declared in a partnership game, the bid winning team exchanges cards. It may be two, three, or four cards, depending on the version of the game. The partner of the bid winner passes first. The objective of the partner is either to add to the total points in meld or to pass trick-winning cards. After receiving the cards, the bid winner examines what will create the strongest hand and then discards an equal number of cards back to their partner. Variations are for the bid winner and partner to exchange the designated number of cards simultaneously, or for no passing to occur. Melding consists of displaying specific combinations of cards to all players. Typically this is done by placing the combination of cards face up on the playing surface until all players have had the opportunity to examine them. All players meld after the bid winner shows meld first. The types of melds include arounds, marriages, flushes and pinochles. These melds are placed under "headings" where a card which is melded under a particular heading can be used again under another heading, but cannot be melded again under the same heading. "Trump Marriage" - king and queen of trump suit - 40 or 4 points, 80 or 8 for double. "Marriage" - king and queen of a suit other than trump - 20 or 2 points, 40 or4 for double. "Flush", "Family", "Rope", "Book", or "Run" - A 10 K Q J of trump suit only - 150 or 15 points. Similar to the arounds, a double run - or two runs in trump in the same hand - is worth 1500 points. A marriage in each suit is worth 240 or 24 total points, which is nothing more than the sum of the marriages, plus kings around and queens around. As a shortcut, this is called a "roundtable", "marriages around", "Round House", or a "Round Robin". The pinochle and dix are the "special melds", the pinochle being the game's namesake. "Pinochle" - jack of diamonds and queen of spades - 40 or 4 points. "Double pinochle" - both jacks of diamonds and both queens of spades - 300 or 30 points. In the most common form of the game (see variations below), any one card may be used in only one meld of each type. Thus, a queen card can be used in one marriage with one king, regardless if the player has the other king of the same suit. However, a queen can be used to score a marriage and a pinochle if the player also has the correct jack. After the melds are displayed, the points are counted and each player totals their individual meld scores. Because all of these values are multiples of ten, one can arrive at simplified values by removing the trailing zero from each point total. For instance, a Pinochle has a simplified score of 4, a double Pinochle would score 30. In playing cards for tricks, there are strict rules of forced play, which limit a player's ability to strategically retain high cards: The high bidder leads the play with the first card, which can be any card in the contract winner's hand, although some rules require the first card led to be a trump card. Then there are two variations of following suit depending if you are playing post-1945 or pre-1945 rules. Pre-1945 rules: Every player must follow the lead suit if possible. Usually every player must play a winning card against those played so far, if it is possible to do so, even when the current player expects a later player to win the hand with a better card. The only exception is if a player played a trump card when trump was not the suit led. In that case, those following that player may play any card of the lead suit, since they must follow the lead suit but are already losing to the player who played trump. So if a player can play a card in suit, higher than any played so far, the player must do so, even if the player expects to lose to a later played card. Likewise, if a player cannot follow suit, but has trump, they must play trump. Again, if a player does not have any cards of the lead suit and can play a trump card higher than any other trump played so far, the player must do so, even if the player expects that a later player will beat the card. If another trump has already been played that a player cannot beat, then they can play any trump in their hand, but they still must play a trump card if they can. Only when a player has no cards in suit, and has no trump, can the player choose to play any card in their hand. Post-1945 rules: Most books today say that unless trump is led you need not try to win the trick. It is only when trump is led that "heading" the trick is mandatory. In pinochle circles and tournaments the post-1945 rules are played about 50% of the time according to Pagat and Hoyle. If two identical cards are played, the first one outranks the second. After the first trick, the winner of each trick leads the first card for the next trick, until all the cards are played. Points are scored based on the tricks won in the hand. There are several ways to count up the points for play, but they always add up to 250 points. The last trick is always worth an additional 10 points added to any existing points in the actual trick cards. The classic counting system of Pinochle is where aces are worth 11, tens are worth 10, kings are worth 4, queens are worth 3, jacks are worth 2, and nines are worth zero. This method takes longer to count the score at the end of each hand. A simpler method is to count aces and tens for 10 points, kings and queens for 5 points, and jacks and nines are worth zero. An even simpler method has aces, tens, and kings worth 10 (and known as "counters"), and everything else zero ("garbage"). Since all points are multiples of ten in the third method, most players drop the redundant zero. Aces, tens, and kings won in tricks are worth one point. The meld scoring can also avoid the zero in the tenth place. Melds like 1,000 aces are thus worth 100. The terms "1,000 aces", "800 kings" and so on are often used, even though the point values are one-tenth. Two-handed Pinochle is the original Pinochle game, while partnership, auction, and all other variants are derivatives from it. It is the game most similar to the original Bezique game, whence Pinochle derived. The only significant difference in its rules from Bezique is the scoring. The original version of Pinochle involves a partial deal of twelve cards to both players in sets of four, leaving a stock of 24 cards. A player can score one meld after each trick won of the first 12 tricks. Melded cards can even be used to win tricks. After each trick, players draw one card from the stock into their hand starting with the trick-winning player. For the last 12 tricks, melds are taken into each player's hand and are no longer announced by the player who wins the trick. The traditional trick-taking rules apply only for these last 12 tricks. In variations of two-handed play, no cards are initially dealt, a distinction from all other variations. Instead, the entire deck is placed face-down on the playing surface between the two players to form the widow. One player begins the hand-building process by drawing the top card of the widow. The player can either keep that card for her or his hand or reject the card. If the player chooses to hold the initial card, the player then draws a second card from the widow, then places it face-down, without looking at it, creating a discard pile. If the player rejects the first card, the card becomes the first card in the discard pile. The second card drawn from the widow must be kept, regardless of whether she or he preferred the first card. Players alternate turns in this hand-building process until all cards are chosen. With bidding, the player winning the bid declares trump, then lays all meld face-up on the table. The other player shows her or his melds as well. Meld points are tallied, and players return meld cards to their hands. Some varieties accept a "Round house", kings and queens of each suit, and earn a bonus 10 points awarding a total of 250 points. Trick-taking commences and continues until all held cards have been played. One variation has no "leading" requirement for the bid winner or subsequent trick winner to lead a specific card, however the rules of "following" are still observed. When adding counters, cards from each player's discard pile are included in totals for a total of 240 counters per round, plus one counter for winning the final trick. One variation to make it more difficult for the bid-winning player, the discard pile created by drawing cards is used by the non-bidding player to score towards tricks. In Three-handed pinochle each player plays for himself. The dealer deals 15 cards to each player and three cards to the widow - a separate pile in the middle. All players review their cards and silently count meld, determining their bids. The player to the dealer's left initiates the bidding process. If the player has a meld, he or she is required to open the bidding; otherwise, they may pass or bid. If he or she passes, the obligation to bid passes to the next player, if meld is held. Once a player passes, he or she is out of the auction. Bidding begins at 300, or as little as 150 for "under-the-gun" bids, and increases in multiples of 10. The highest bidder wins the auction and turns up the three-card widow for all to see. The three widow cards are placed in the bid winner's hand. The bid winner then declares trump and lays down meld. The other two players also lay meld face-up for count. After the appropriate points have been tallied the bid winner must set aside any three cards that have not been melded, though if not enough cards remain in the hand they may be taken from melded cards. This will reduce the bid winner's hand to 15 cards. For all three players, meld is now returned to each respective player's hand, and the round is played. During the round, a player must take at least one trick to "save one's meld", even if the trick contains no points; otherwise, no meld points will be counted for that player during that round. After all tricks are taken, counters are tallied for each player. The three discards by the highest bidder count toward their counter score for the hand, so there is always a total of 250 points for the trick score among the three players. If the highest bidder fails to make their contract by adding meld points and trick points from the play, then their score is negative the amount of the bid for that hand. After viewing the widow, the highest bidder may concede the hand and take a negative score for the amount of his bid; however, they still must name trumps and the other two players score their meld. Conceding the hand does save the trick points opponents would score playing their hands, although opponents will not have an opportunity to lose their meld by failing to take a trick. A player may not attempt to play the hand for more than 250 points. For example, if the bid is 350 and a player has only 80 points in meld, that player is forced to concede. If a player is about to win, it may have been worthwhile to play the hand and try to deny that player a trick. Remember, the decision to concede a hand must be made before seeing the opponents' meld. A player forced to take the bid for 300 points may choose to concede without viewing the widow. His score is lowered by 300 points, and the opponents score nothing for the hand. This strategy is useful when another player is close to winning. The widow can often salvage a hopeless hand, so it pays to look when nobody is close to winning. "Highest Score": If there's a tie, play another hand. This is the least desirable method. "Overtime": The game is extended and is now a contest to 1250 points. If two players exceed 1250 points on the same hand, the contest lengthens to 1500 points. This rule holds regardless of score fluctuations (players "going minus" - failing to reach their bid amounts - and falling below 1000 points. "Bid and Out": If two players exceed 1000 points on the same hand, then the high bidder for that round automatically is declared the winner. If two non-bidders exceed 1000 points on the same hand (extremely rare), then Method #1 or Method #2 would apply. The advantage of this method is that it very interesting when two or all three players are close to 1000 points. any other action that disrupts the harmony of the game. If the bidder reneges, he automatically takes a double set and the amount of his bid is subtracted from his score. The 2-opposing players get to count their meld points and the remainder of the hand is thrown in. If either of the 2 nonbidders accidentally misplay, the bidder automatically makes his bid. The bidder gets to score the amount of his bid and his meld, the player that misplayed loses all meld and takes a single set, and the third player scores only his meld. Similar to Three-handed Pinochle, Cutthroat is a simple modification. The dealer deals the entire deck out (16 cards to each player), in packets of 4. The player to the left of the dealer begins the bidding once meld has been silently determined by all players. Play continues normally in terms of scoring and trick taking, according to house rules. The only way to win in Cutthroat Pinochle, however, is to "Bid and Out," or to have taken the bid and surpassed the predetermined winning score. It is then possible for multiple players to go over the winning score, yet if none has taken a bid and met the resulting contract, a win has not happened and play continues. It is also possible for a person to lose with the high score if they do not take a winning bid. Four-handed Pinochle, or partnership Pinochle is played with two teams consisting of two players each. Partners are seated opposite from each other. Each player is dealt 12 cards. The opening bid is typically 150, but can be a higher agreed on value. All four players may bid. Both the bidder and his partner have their score count towards making the contract. High bidder names trump. There typically is no kitty. With a kitty, the four cards are distributed, one to each player, by the bid winner. Each hand must meld separately: If your partner has a spade marriage, you may not put down the diamond jack for a pinochle; you must also have a spade queen. As in the three-handed version, the first player is forced to bid when holding meld. Play is often to 1000 but can increase to 1500 during partnership. Optional rules for partnership Pinochle include forcing the dealer to bid 190, or some other agreed amount, if the first 3 players pass initially because they have no meld. In another variation, the winning partnership must, before melding, exchange 3 or 4 cards from each of their hands. This version is usually played to 1500. A player may announce they will "Shoot the Moon" or "Go Alone", declaring to all the other players that they are going to attempt to capture all the tricks in the current hand. If so, they earn 1,000 points and win the game. If they do not, they subtract 1,000 points from their score. This must be declared just before the tricks are going to be played out. Some versions give the game to a team which successfully 'shoots the moon', others automatically give 250 points for this no matter what the bid was. Games with five hands or more typically modify partnership Pinochle in a variety of ways. They are generally played with 1 1/2 or doubled decks, with extra dix added or withheld to make an even deal. With an odd number of players, the bidder asks for a desired card in the trump suit, with the first matching player being partner for that hand. Everyone else plays against the team. In larger groups, one or more players can sit out each hand allowing the remaining players to follow the appropriate rules for the respective number of players. Check pinochle is a gambling variant of three-hand. It is the same as to 1000, except that players keep track of "checks". If you are playing $1 stakes, each check you gain means that the other 2 players owe you a dollar. The following events cause a gain/loss of checks. Note that checks for meld can be earned either by the bidder or non-bidder. Checks are kept even if you do not make your bid or "throw it in". Today "Double Deck" pinochle is a popular form of the game, exclusively played by the National Pinochle Association, the American Pinochle Association, the Cambridge Pinochle Association, and is played for the "World Series of Pinochle". Double-Deck Pinochle is played with 2 Pinochle decks, minus the nines. This makes for an 80 card deck. Play is similar to regular Pinochle, except 20 cards are dealt to each person and minimum bid is increased to 500 points. In some variations, bids are made in increments of 10 or more points until 600 is reached, then by 50 points. This version often features "meld bidding", a bid to your partner letting them know what you have in your hand. This can be any numerical bid, and it is advised that you talk to your partner before the game so you have a better understanding of what their bids mean. For instance, a bid of "510" after an opening bid of "500" by the first bidder could signal "aces around" (but ONLY in this specific bid sequence). Alternatively, this could mean that the bidder is asking for meld from their partner (anytime a player bids 10 more than the player before them). A bid raise of 20 or more is to let your partner know what you have in your hand. Remember, it is best for all to talk to your partner before the game begins. You may not use a passing bid of "by me" to signal ten points held. The only communication during bidding should be a numerical number or "pass". Any other way of communicating is called "talking across the table" and is forbidden. There are occasionally different meld values for a run and a pinochle; a run being 250 or 150 points, and a pinochle being 150 or 40 points. All other aspects of the game generally remain the same. Other variants in double deck: 1. You must have a marriage (KQ) to take the bid and call trump. 2. You must have at least 20 meld points between you and your partner and be within 50 points of the bid to play the hand. 2. You must always make the difference between your meld and bid with your trick-points, never making less than 20 or you shall go set. 4. The non-bidding team must have 20 meld between them to have it counted and make at least 20 trick-points to save it. 5. You must either deal four or five cards and a time. 6. There are 50 possible points, 48 trick-points and 2 for taking the last trick. In triple-deck pinochle six play in two partnerships of three each; each player has an opponent at his right and left. Three pinochle decks(no nines), are mixed together, making a pack of 120 cards. Each player is dealt 20 cards, and the rules of double deck pinochle apply, except that the minimum bid is 75, and the last trick is worth 3 points. most of the extra melds made possible by the triple pack do not count extra. i.e. if a player should hold twenty aces, five of each suit, the value would be that of double aces and triple aces combined. Internet Pinochle is almost always "double deck" except for a few applications for some smart phones. Today the Internet is host to many live professional cash tournaments, although many are still cautious about playing online because of potential cheating. Note that this use of the term "racehorse" is inconsistent with the commonly understood meaning of the term when applied to Pinochle. As aptly summarized by Dave LeVasseur: "Racehorse means that, after the winning bidder has named trump, that player's partner passes cards across the table"
Played much as the same as "double deck" but to 6 hands, the point values are inflated. Two teams are formed, 20 cards are then dealt to each player and 4 cards are dealt to the blind. Bidding commences with the person immediately to the left of the dealer automatically bidding 500. The winner of the bid includes the blind into his hand, calls trump and melds. Note: All Runs, Double, Triple, and Quadruple, Marriages must be in Trump. The game continues with the standard rules of play. When the play is over each team adds up their points in the count with kings, 10s, and aces worth ten points, while queens and jacks are worth zero. If a team count plus meld does not equal their bid, they "go set". By going set the amount of the bid is subtracted from the teams score and their count is discarded. The other team retains both their meld and their count provided they took at least 10 points in the count. Two full decks are dealt between eight players, forming four teams. Team members are spaced so that they are not able to see any other hands. The game is usually played to a score of 5,000 or higher. Other than this, the four player rules apply, and any variations may also be used. There is an increased possibility that when one team declares trump another team may have an equal number of trump also, which may lead to an interesting game. An optional scoring rule rewards 1,000 points for a quadruple pinochle--four jacks of diamonds and four queens of spades in a meld. One variation on winning allows a team or individual to win instantly from any score by taking all the tricks in a hand. To win in this fashion, the winning player or team must play very skillfully to prevent opposing players from taking even one lowly (even zero-point) trick. This victory is known as "PInochling". A player or team can play for this victory even if they are not the highest bidder. "Pinochling" does not require a bidder to make their bid. They also can play for this victory even if their bid cannot be made with the maximum number of trick points available plus their meld. However, the highest bidding player or team can prevent other players from attempting this if they elect to "throw in" the hand before the first card is played. When playing "bid-out" rules, a team can win without bidding if their score reaches (and remains above) the agreed upon game-ending score while their opponents fail to make their bid 3 times. This is known as a "slide-out". Anthony Collins, champion pinochle player, member of the National Pinochle Association, and author of Winning Pinochle Strategies Morris Publishing (2001). L Roy Ram, Champion pinochle player, member of the National Pinochle Association and American Pinochle Association, author of "The Complete Guide to DoubleDeck Pinochle". Pinochle Press (2004) A 256 page reference work, indexed with a glossary. Joe Andrews, master of most trick taking games, author of various books for the U.S. Playing Card Company on trick taking card games and head of Grand Prix Tournaments-"The World Series of Pinochle", he also has various YouTube videos on playing pinochle. Tobor Leigh, founder of The Cambridge Pinochle Association, winner various card tournaments with over a dozen in pinochle. James "Bernie" Walker, the President of the National Pinochle Association. Bill Walker, founder/owner of The American Pinochle Association. Walter B. Gibson, 1897-1985, magician, author, and pinochle expert, wrote various book in the 1970s on pinochle including Pinochle, how to play, how to win (1974).